Add these delicious chocolatey bites to your assortment of Christmas desserts for a sweet time. Combine popcorn and nuts in large mixing bowl. Melt margarine in small saucepan. Add brown sugar, honey and salt and bring to a boil over medium heat, stirring constantly. Boil for 5 minutes, stirring from time to time. Add in vanilla and remove from heat. Quickly pour sugar mixture over popcorn and nuts, stirring with a spatula until well-coated. Spread mixture in a single layer on a lined baking tray. Bake for 30 minutes, stirring at least once. Cool on wire racks and break into chunks. Place chocolate in a mixing bowl, and melt in a bain-marie. 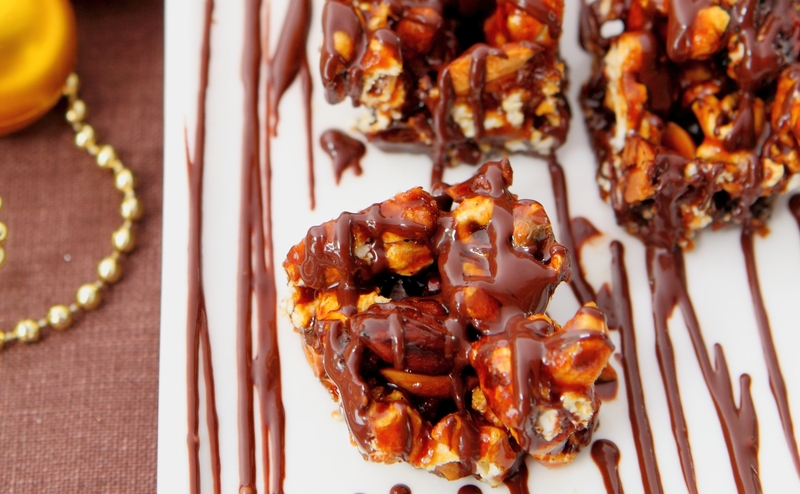 Drizzle melted chocolate over the chunks. Allow to cool and for chocolate to set before storing in an air-tight container.